A sign of the continuous evolution of Maltese athletics is the increasing breadth of events covered by local athletes who are now hitting highly respectable results in competitions that up till a couple of years back struggled to attract a decent field. Having just experienced some great results in the 400m hurdles, Daniel Saliba falls squarely into that category. That he was going to be a trailblazer in this event was clear from early on. “I was always told that I have a really good physique to run hurdles,” he says. “My coach had encouraged me to try the 400mH and see whether it was for me. With only a few training sessions on hurdles I went for my first race and did pretty well. “It was a great motivational boost for me,” he added, and so it should be. During this year he has broken three Malta records which is in itself a source of pride. There is no secret for this success other than hard work. “I worked very hard from the first training session of this season and I was completely committed,” Saliba said. “I knew I was doing everything I could to be in the best shape I could possibly be in this season, so I was expecting to have such results because that is what I was aiming for and believed I could achieve. This might seem an easy progression but there is an intrinsic difficulty on to the event that should not be discounted. “The 400m hurdles is considered to be one of the toughest events in athletics,” Saliba explained. “Having said that, to be able to run and do well you need to train yourself both physically and mentally. This event has helped me build an enormous amount of mental strength and toughness. As a result of his efforts Saliba is among a select group of athletes who have already qualified for the Games of the Small Sates of Europe as well as the European Championships Third League that will be organised in Malta between June 24 and 25. 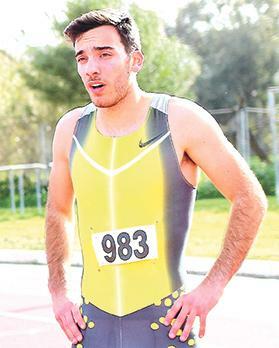 “Representing Malta on our home track is always a great honour,” Saliba said.